It wouldn't be an imminent hardware launch without a few leaks here and there, and it now appears that information and images of one of the premium X470 motherboards has been revealed (accidentally or otherwise). 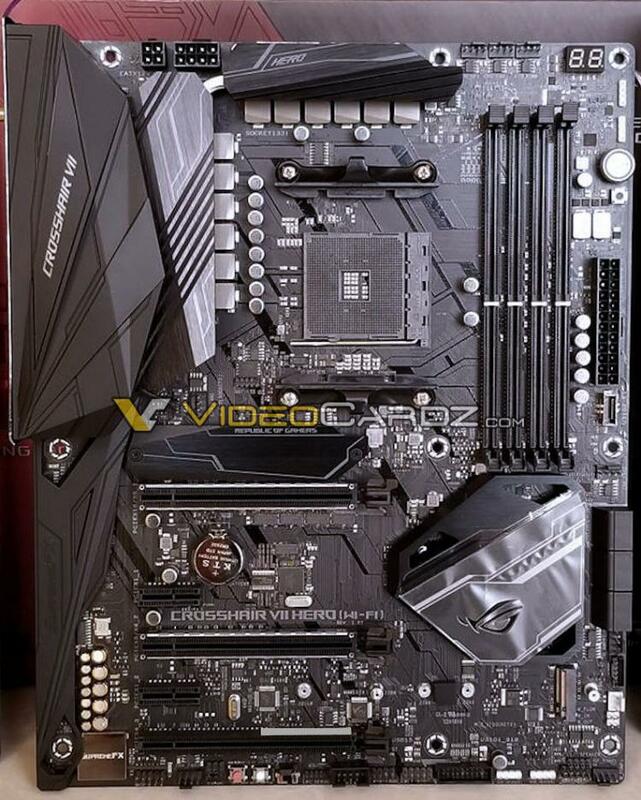 Videocardz.com have sourced pictures of the ASUS ROG Crosshair VII Hero WiFi, a model that's likely to be in the upper-middle tiers of their range for X470 motherboards that complement Ryzen 2000-series CPUs due in the very near future. Perhaps the first thing to note is that this isn't a simple rebadge of the X370 Crosshair VI Hero WiFi. For a start, the layout is cleaner and much less busy, which is often the hallmark of generational improvements that change neither socket nor chipset substantially. One feature that's missing on the new board is a PCI-E x1 slot just above the primary x16 slot, perhaps in recognition that this slot is so very rarely used. Instead it's been blanked off with a plate emblazoned with ASUS ROG branding. The board retains both 4-pin and 8-pin CPU power connectors alongside very substantial power delivery systems, underscoring its overclocking potential. VRM heatsinks are oversized, complete with more ASUS ROG branding, and may be black rather than silvered this time (although that could be a trick of the light). Two full-length PCIe x16 slots indicates continued support for multi-GPU configurations, and ROG have reinforced them to take the additional weight of a hefty GPU cooler. Meanwhile the control buttons have been rearranged, with the 'Start' power on button moved to near the 24-pin power connector from the bottom edge of the board, but nothing critical appears to be missing. In its transition to X470 the Hero has lost two SATA III connectors, down to six from eight, in exchange for what appears to be an additional black 4-pin fan header and RGB lighting header. It's also lost two USB ports from the rear I/O, now featuring twelve USB ports in some combination of 2.0, 3.0 and 3.1; however the PS/2 mouse/keyboard combo port does return, for those who really like their legacy hardware. Other than that there are few surprises. Despite theoretical chipset support ASUS ROG have opted not to include video-out - you'll instead need to rely on a discrete GPU. That also means it will be down to the graphics card to support Netflix 4K streaming, irrespective of AMD's plans for compatibility with Ryzen APUs. There will no doubt be more revealed in the coming weeks. AMD X470 motherboards from all manufacturers are due on April 19th, alongside Ryzen 2000-series desktop CPUs. The X470 series should also be backwards compatible with Ryzen 1000-series CPUs, but support unique features with the latest generation.